A noted lawyer and judge, politician, and Supreme Court justice. After graduating from Kenyon College in 1832, Davis earned a law degree from Yale in 1835. He was admitted to the Illinois bar the same year and in 1836 established a practice in Bloomington. He was active in state and national Republican politics, and was elected in 1844 to the state legislature and three years later served at the Illinois Constitutional Convention. In 1848 he was elected judge of the Eighth Judicial Circuit, a position that placed him in regular contact with lawyer Abraham Lincoln. The two developed a close friendship while riding the circuit, which covered fourteen central Illinois counties. Davis is credited with engineering Lincoln's presidential nomination at the 1860 Republican convention where he worked tirelessly for days organizing Lincoln supporters and lobbying delegates. Lincoln rewarded him in 1862 with a Supreme Court appointment, a position held until his election to the Senate in 1877. While on the Court, Davis wrote the majority opinion in Ex parte Milligan, a landmark decision restricting the right of military courts to try civilians. Davis disassociated himself from the Republican party after the Civil War and in 1872 ran for president as a Liberal Republican. Five years later he was elected to the Senate, a position he held until he retired, in 1883, to Bloomington. Davis died there 3 years later. Completed in 1872, it is a model of Victorian style and taste. Built for U.S. Supreme Court Judge David Davis, the fifteen-room house was occupied by several generations of the Davis family. 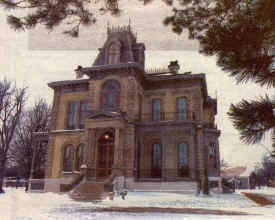 The mansion was donated to the State of Illinois in 1959 by David Davis IV and his nieces. David Davis was a long-time Bloomington, IL resident. He established a law practice there in 1836 and married Sarah Walker, the daughter of a Lenox, Massachusetts judge, two years later. In 1844, Davis acquired 200 acres and a frame farmhouse on Bloomington's eastern edge. Davis and his family occupied the old farmhouse for 28 years (1844-1872). During that time they added 1,000 more acres to the property. In 1870 the Davises began work on a new brick house, one more in keeping with their considerable wealth and social standing. Davis had been appointed to the U.S. Supreme Court eight years earlier. He hired Alfred Piquenard, one of the Midwest's leading architects, to design the new residence. The old farmhouse was moved off its foundation, and in its place the grand yellow brick mansion took shape.